dftly Blog - Page 3 of 3 - Salesforce + Mobile = Nirvana! A couple of weeks ago, I met up with a group of friends. I was astounded by the eidetic memory of one of them. As she showed pictures from 37 years ago, one of the women was able to rattle off dates, events, anecdotes of people. Down to even the names of the dogs at one of the houses. I’m pretty sure that one of the reasons that those memories were so strong was that the exchange program was so seminal in her formative years. But what of less influencing events? How do we manage those? How do we ensure that we actually do everything that has to be done, complete all the tasks and activities of our daily work life. And that of our home life. Can we rely on just our memories to carry us through all of that ever-expanding domain? remember my dad’s to-do lists. Every morning, his first task would be to make a list of all the things that he had to through the day on a sheet of paper. He would tick off tasks as he got them done. Today, with To-do lists on our ubiquitous mobile phones and wearable technology, it’s easy to organize and get work done efficiently. With multiple calendars on our mobile phones, you can set up all your meetings and timed activities on your calendar with reminders to make sure that you don’t miss a thing. resource-constrained non-profit world. Technology becomes key to handling large numbers of volunteers who come in at different times to do different tasks. You can use technology to post your volunteer opportunities on mobiles or on the web. It’s not just McDonalds that can get people to self-serve and clean up after themselves. Volunteer tracking software allows your volunteers to sign up for those opportunities at their convenience, either on their mobiles or on the web. Automatically send out registration confirmations, event reminders and thank you emails. Generate online / mobile-based signup sheets and rosters. Volunteers can check in/out of their assignments to track the time spent and send you feedback online. You can use volunteer tracking to identify your star volunteers and recognize them. The return on investment includes reduced workload for harried nonprofit staff, greater convenience and better engagement with volunteers, and the ability to ensure that the right number of volunteers are available for your projects. So for those times when just memory does not suffice to recall how many volunteers actually showed up for an event or how long they actually worked, volunteer management technology is definitely the answer. Last week, we spoke about how to set up an iPad for public access using Guided Access. This week, we talk about how to use the Single App method for putting an iPad into a Kiosk mode. The answer lies in what your exact requirements are and how much effort you are willing to put into setting the iPad up. Single App mode means that it locks your iPad to a single app. This is a more advanced method and you need to use Apple Configurator or a mobile device management server to enable this feature. You can only disable the mode using the same tool that you used to enable the feature. If you don’t have access to the Apple Configurator, then you can only use the Guided Access method. In this method, the mode is secured with a PIN. The downside with this is that people can try to guess your PIN number to use other apps or to reset your iPad. So make your decision on which method to use based on access to the Apple Configurator and how secure you want the device to be. Kiosk mode with the Single App mode. To start using your iPad in a Single App mode, you first need to put your iPad into a Supervised mode. To do this, go to the iTunes Store and install the Apple Configurator. if you don’t already have the Configurator. You have to install the Apple Configurator on a Mac as it does not work on Windows. Once the Configurator is installed, use it to place your iPad into Supervised mode. Then you use the Configurator to enable Single App mode. The entire process can be done in 3 steps. Click on Settings and then on iCloud. Now slide the Find My iPad button to the Off position. This will disable the Activation Lock that will prevent Apple Configurator from setting up your iPad. Have your iCloud password handy to complete this step. First, connect your iPad to your Mac via a USB cable. Once your iPad is recognized, open the Apple Configurator and select Supervised Mode. Now, click on the Actions menu, then click on Advanced and select “Start Single App Mode”. Now your iPad is in Single App Mode. You’ll be shown a list of all the apps on your iPad, including the system apps and the apps that you have already installed. Select the app that you want to lock the iPad to. You can click on the “Options” button to enable/disable specific features such as Touch, Motion, Volume, Sleep/Wake etc. You can choose to enable only those features that make sense for you. Click the Select App button when you are done. And now your iPad is truly locked to just this one app. To Disable the Single App Mode, connect the iPad to the Mac. Open the Apple Configurator. Select the Actions menu > Advanced > Stop Single App Mode. So make your decision on which mode makes sense for you and set up your iPad to work safely and securely in a Kiosk mode for public use. Setting up an iPad for public use. there are plenty of options to suit any budget range and your specific physical needs. And these physical security devices are available for desk, wall, floor and rail mounting options. Whether you need a floor mount for your iPad, a wall mount for your Android tablet or a desk mount for your Windows Surface device, you have many options. With options for rotate, tilt and switch, these devices give your users the flexibility to use the iPad/Android device in a multitude of ways. Starting in price at around $ 50 going all the way up to $ 500, security devices span a large price range. The next thing you need to think about is application security. How do you prevent users from switching apps on your iPad either accidentally or because they quickly want to check out their Facebook page? How do I lock down my iPad for just one app? There are two ways to lock down your iPad to a single app. Guided Access and Single App Mode. Guided is the quickest, fastest way to put an iPad in a Kiosk mode and is often thought of as parental control mode. It allows you to temporarily lock and iPad or iPhone to a single app. To leave that app, someone will have to enter your PIN or provide your fingerprint. The Single App Mode locks your iPad to a single app. This is a more advanced feature and this is what we suggest to our V4S Kiosk users. 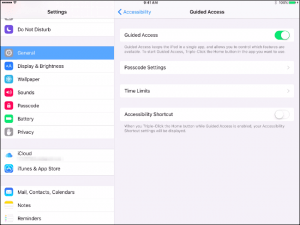 Guided Access is a quick and dirty method of locking your iPad to a single app. To do this first enable this feature by going to the Settings app and going to General > Accessibility > Guided Access. Slide the Guided Access slider to the On position. Next, tap the “Passcode Settings” to set a PIN for guided access and choose whether or not you can exit Guided Access with a Touch ID, if your iPad has a Touch ID sensor. You can choose to use the same ID that you use to unlock the iPad or use a different one. Just make sure that you note down the ID in a safe place, in case you forget it. Next, launch the app that you want to lock your iPad to. Quickly press the “Home” button three times. You have now entered the Guided Access mode. There are 3 main options to set up here: Hardware buttons, Touch and Motion. volume down. Similarly, you may want to disable the Sleep/Wake button to prevent the iPad from going to sleep (or powering off), if someone touches that button. The OFF state means that those buttons are disabled and will not respond when pressed, once you have started the Guided Access mode. You can turn touch gestures (taps on the screen) on or off, depending on your specific situation. If your app needs to be interactive (as with V4S Kiosk), then keep Touch enabled. If you are playing a video in a loop and don’t want people to stop it, then disable Touch. Use this option to prevent your iPad from changing orientation when the user rotates the device. To do this disable this option, slide the Motion option to off. If your app relies on a particular Portrait or Landscape mode, then rotate your iPad to the particular orientation, then switch Motion off. Now the display will remain fixed, even if the user rotates the device. Once you’ve set up all the Guided Access setting to the way that you want it, tap on the “Start” button on the top right of your screen. Your app is now running in the “Guided Access” or “Kiosk” mode! Try tapping on the Home button or the volume buttons. Depending on how you’ve set them up, you’ll see that they make no difference. You will see a small message on the screen letting you know that Guided Access is enabled. Triple-click the Home button. Enter the passcode that you configured. You’ll be taken back to the Guided Access setup screen, where you can End or Resume Guided Access. And that’s all there is to put your iPad into a “Kiosk” mode. Next week we’ll talk about how you can use the Single App Mode on your iPad. Configuring dftly Time Tracker to your requirements. Last week, we spoke about how powerful Salesforce’s configuration options are. It is configuration that allows Salesforce to fit into many different business situations. With the dftly Time Tracker, we give you a layer of configuration above and beyond those provided by Salesforce. You get several configurable options to make the Time Tracker fit your business needs and requirements closely, without having to go through the time and expense of a “customized” solution. The idea is to enable you to match dftly Time Tracker to your business process as closely as possible. And to do all this easily and quickly, without having to depend on busy programming staff. You can configure everything that you need with a series of drop downs, clicks and check boxes. to. Let’s say you want your Sales team to track time to Opportunities and Tasks related to them rather than to Projects and Tasks. So now your Sales team would see Opportunities and Tasks as the two drop downs on their mobile phones. You can do that by selecting Opportunities and Tasks as the two drop downs that your users see, when you configure the Time Tracker. You can also choose the specific fields from those two objects that will actually show up on your user’s mobile phones. If you want each user to see only those Opportunities that are assigned to him/her, you can set that up as a filter condition, when setting up that specific configuration. Let’s say now, you want your Service Engineers to track time to Orders and Cases. You can set up another App Key that will allow you to set up a different set of drop-downs from what you set up for your Sales team. Again with the same level of granularity for Orders / Cases assigned to specific Service Engineers. your mobile users can track time to. Let’s say you have construction teams and you want to track time when they Travel, Load/Unload Equipment, Lunch Breaks and Work, you can do that very easily. Now let’s say you are a healthcare business where your therapists travel to patient locations, you could choose to track time for Travel and Therapy. For each Check-in Type, you can select whether your users need to take a photo at the beginning and end of each transaction. And you can even configure the colors for the icon to match your company colors. All of these options go back to our original premise that configuration allows a business-focused user to personalize aspects of a system, without having to depend on programmers to do so. Salesforce is an extremely flexible and powerful platform that works for many different implementations. Its power comes from the degree of configuration that it provides, out-of-the-box. Taking off from our previous post, configuration allows a user to personalize aspects of the system without having to depend on an experienced programmer. With customization, you need bespoke programming done by an experienced programmer. With Salesforce, there’s a huge range of things that can be done with just configuration. Starting from adding a few simple custom fields to let’s say an Account or Contact object in Salesforce to configuring complex workflows to automate tasks to managing security and data access through profiles and roles – all of these are possible with just configuration. All with a point-and-click interface, without needing to know any programming. The key is for the user (generally the Salesforce Administrator) to understand the business processes of the organization and to have a clear understanding of objects and how they relate to each other. Configuration is a fast, intuitive and relatively simple way to tailor Salesforce to work exactly the way that your organization needs it to work. The individual making the changes needs to be business-focused, not code-focused. With no dependence on understanding coding or dependence on syntax of a programming language, a person who understands the business is empowered to completely configure the powerful Salesforce platform to the organization’s exact requirements. And with the vast Salesforce ecosystem, you have an almost unlimited amount of tutorials, knowledge bases, forums, videos and documentation to help you in your configuration quest. Configuration is several orders of magnitude less problematic to deal with than customization. But you really need to understand what you are trying to configure and to understand the complexities of the platform, before you attempt making changes to the system. Fortunately, Salesforce gives you the additional comfort of a “sandbox” system where you can make all your configuration changes and test it out before deploying the changes to your production environment. As an example, let’s consider Salesforce’s Process Builder. Builder is a relatively easy-to-use, visual business process automation tool that can trigger a wide variety of automatic tasks or actions. Process Builder takes the work out of repetitive tasks by automating them and streamlining them. Process Builder has a simple user interface, but is powerful enough to send out emails or update fields or for activities to automatically occur based upon preset triggers. The vast majority of automatic tasks can be automated using this simple point-and-click mechanism. So the crucial question to ask yourself as you start to setup Salesforce for your organization is how deeply you need to modify Salesforce to serve your specific requirements. Break your business process down into various options. See how much of that can be met with configuration. Only after you exhaust all avenues for configuration, should you even consider the possibility of customization. You could use process builder to send out automatic email to a manager when the value of an opportunity value is greater than a preset amount. You could set up an email alert to be sent to a service manager if a Case is not responded to in a specified time-frame. In using dftly Time Tracker, we have customers who set up an automated rule to pre-populate Account related information such as Address to custom fields on the dftly Projects object, when an Opportunity Stage changes to Closed Won. The bottom line is that with all the configuration tools at your disposal with Salesforce, you really should be able to fit between 70 – 80% of your requirements with configuration. Consider customization only for the remainder of your requirements. Next week, we’ll talk about how we build on top of the Salesforce configuration to add configurability to the dftly Time Tracker. Configuration or Customization – what makes sense? As a society we are increasingly using online or cloud-based software in everything from buying clothes to managing our bank accounts. As you look around for cloud software for your organization’s needs, you’re quite likely to hear the terms “configurable” and “customizable” being thrown around, sometimes interchangeably. It’s critical that we understand the difference between these two terms. A configurable system is an out-of-the-box solution that allows a user to personalize some aspects of the system themselves, without having to depend on experienced programmers. Configurable software is generally flexible and scalable and can be shaped to meet an organization’s requirements. While the system comes with a default configuration that works out-of-the-box, it generally lets you tweak the system with simple drop-down menus and lists to more closely reflect your own business. Configurable software gives you the advantage of best practices from the industry and other organizations. But overall, may not fit your requirements exactly. Since you can do the configuration on your own, there is generally no additional fee that you need to pay. Customizable software, on the other hand, requires bespoke programming, generally done by the software company’s technical team or by a partner. With customized software, you get software that fits your requirements exactly. But because you are getting it specifically developed for you, the software itself does not evolve with usage from multiple companies. Whenever you need changes, those changes need to be specifically made for you and therefore will be both time-consuming and expensive. could get a shirt custom stitched to your exact size OR you could buy a shirt at a store. The custom stitched shirt is the equivalent of customized software, whereas buying a ready-to-wear shirt in a store is the equivalent of configured software. You can “configure” the shirt in the store by choosing your specific collar size, sleeve length from the variations available in the store. The custom shirt is specifically tailored for each of your lengths and sizes, but takes longer to make and may not have all the bells and whistles that come with the factory-made shirt. In software terms, we would say that the “configured” shirt has all the best practices from the industry. Coming back to software, configurable software allows for users to re-arrange key elements of the software to suit their own business requirements, without programming changes. While customized software that works exactly to your specifications is alluring, the overall cost and time involved is generally prohibitive. Like with most things, the 80-20 rule holds true for software implementations too. Check to see if out-of-the-box solution fits 80% of your requirements. If it does, you should be able to get the remaining 20% of the functionality through configurations, eliminating customization completely. This post is the first in a 3-part series on software configuration. Next week, we’ll talk about how configuration makes Salesforce so powerful that it has become the platform of choice for many different implementations. The following week, as an example, we’ll look at how configuration works with dftly Time Tracker. Posted on 1 June 2017 22 June 2017 Author Surekha ShettyCategories Software, Time TrackingTags configuration, customization, point and click, process builder, salesforce, workflows1 Comment on Configuration or Customization – what makes sense?